00:30:00 Makes 2 servings, 1/2 recipe (436 g) each. Makes 2 servings, 1/2 recipe (436 g) each. This sweet-and-savoury main-dish salad is packed with flavour from the crisp green beans, tart cranberries and zesty dressing. Bring 3 cups water to boil in large saucepan. Add pasta; simmer on medium-low heat 8 min., adding beans for the last 3 min. Meanwhile, cook chops in 1 Tbsp. dressing in skillet on medium heat 3 to 4 min. on each side or until chops are browned on both sides and done (160ºF). Remove chops from skillet; cover to keep warm. Add cranberries, 2 Tbsp. syrup, garlic, 1 tsp. soy sauce and remaining water to skillet; cook on medium-high heat 3 to 5 min. or until reduced by half. Drain pasta; rinse. Combine onions, remaining syrup, dressing and soy sauce. Add to pasta; mix lightly. 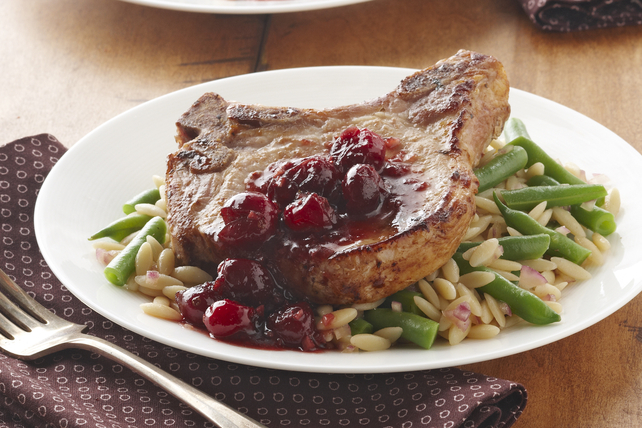 Serve with chops and cranberry sauce. Orzo mixture can be prepared ahead of time. Refrigerate until ready to serve with the cooked chops. For best flavour, bring orzo mixture to room temperature before serving. Serving Size Makes 2 servings, 1/2 recipe (436 g) each.